This is a good deal for any gamer who wants quality features at an affordable budget. It is, however, a bulky device that could be unfavorable for portable use. The machine has modern display features. The machine loses to its competition on the weight and size aspects as well as the spongy keyboard. Backlit keyboard with macro keys. Great IPS 17.3-inch display with G-Sync technology. Build quality is inconsistent too. When shopping for a gaming laptop, the market has tons of choices to offer. 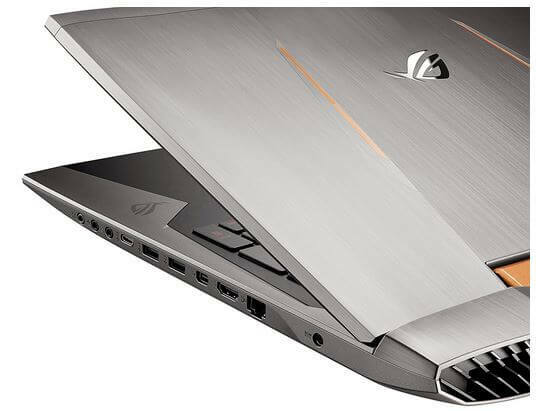 However, not many laptops can stand against the glorious Asus ROG G752VT notebook. When the Asus ROG line was introduced at the 2015 IFA, it never seemed to be anything more than a face-lift. Well, it went on to drop a red and black gaming appeal for the unique bronze and silver accents. The birth of the G752VT model into the ROG gaming line brought about the incredible side of the Asus machines. If you are looking for a modern, bulky machine that can handle any new game, the Asus ROG G752VT notebook has it all. The machine can handle things at high settings on full HD resolution. Nicknamed as the Silent Beast, this machine is the latest revision in the G series signature. To be honest, the notebook came forth not in the exact appeal we all expected. In our review, we will highlight how the new G752 has made a few strides towards improving the former G751 model. For the longest time, the Republic of Gamers’ notebook lineup has been either close or at the top of the best gaming notebooks. The new G752 brings on a complete redesign, and the vapor chamber cooling is a brilliant feature. It offers the line a marketing edge. It is important to mention that the manufacturer has the vapor chamber cooling system on certain high-end SKUs. The Asus ROG G752VT notebook does not feature the efficient cooling system so you still might need a laptop cooling pad. However, the machine comes with a flashy look. Our review will delve into the machine upgrades to identify any hardware improvements and any updates from its predecessors. The G752 ROG model comes with major changes on both the outside and inside looks. It comes with a sharper accent of a copper-colored brushed aluminum surface. There are hints of a textured plastic on the front edge. The palm rest is slightly rubberized with sharper exhaust vents. Users can have a glimpse of the cooling system thanks to the transparent plastic window on the aluminum belly. It is true to say that Asus has gone for the brighter and a little bit complicated designs that attract many gamers. The Asus ROG G752VT is built like a tank. This is a behemoth of a gaming notebook. As for the weight, the bulky laptop weighs 4kg – that is really heavy. It is a portable version of the desktop PC. The machine has truly lost to its competitors like the Gigabyte P35V5 notebook, which weighs 2.3kg. If you intend to carry your gaming laptop around, then the ROG device is not such a good choice. The back of the chassis has been extended so as to accommodate the cooling system. This makes it too long, meaning the Asus ROG G752VT is bigger than the average 17.3-inch laptop. Let us look at the impact of the new features to the machine’s build. In fact, the quality of build has really suffered for this model. Twisting the rigid base from the front edges is difficult. With some force, the surface directly above the optical drive and the center of the keyboard can be depressed. Unlike in the previous G751 model, the G752 model features multiple sheets of materials used. This creates unintentional gaps where the materials meet. The gap between the front corners of the palm rest and the plastic material immediately underneath can allow it to be pushed. This manufacturing defect is also found in the Lenovo Y50 but to a lesser degree in the Asus machine. Pressure down the center and side-to-side twisting could affect the outer lid. This is, however, not significant to cause any harm. The taut bar hinge prevents heavy teetering of the lid. This allows up to 120 degrees. Attempting to twist or depress the surface, the notebook exhibits some creaking. The machine has lost to the likes of the 17.3-inch rivals such as the Eurocom P7 Pro and Alienware 17. The new Asus ROG G752VT has inherited all the physical ports from the G751 model. There is an introduction of the USB 3.1 Gen 2 Type-C port that doubles as Thunderbolt. The VGA has been dropped in the new model. The rival notebooks have additional two USB 3.0 ports that are missing from the Asus model. There are two full-size DisplayPort ports in the Eurocom P7 Pro machine and a Graphics Amplifier port in the Alienware 17 allowing for graphics support. There are no ports on the rear, unlike the models mentioned above. This has forced in more ports on the right side. This crowding is unfavorable for those using right hands. For connectivity and communication, there are WLAN and Bluetooth 4.0 adapters provided by the Intel Dual Band (2×2) wireless-AC 7265 module. This is designed to offer up to 867 Mbps transfer rate. The gaming-centric Killer wireless cards are missing, though. Likewise, the GPS or WWAN options are not present. On the brighter side, the Asus ROG G752VT features a full-sized keyboard with a Numpad. The keycaps are large with function keys placed appropriately. The key travel is respectable. Finding the arrow keys is easier since they have been offset towards the user. The machine has a dedicated row of keys above the usual function keys. These are six macro keys. Such quality keyboards are found in the Lenovo T-Series and MacBook Pro 15. The keyboard is backlit. Unfortunately, there is excess light leaking from around the keycaps causing distractions in a dark room. The 3 levels of backlight brightness are sufficient for basic use. The market has, however, been treated to the new RGB LED keyboards that have custom control software. The touchpad is large and highly responsive. It has its own clicky, tactile right and left mouse buttons. It is located below the keyboard. This is a feature that was well created unlike the previous Republic of Gamers rigs. Navigation here is a breeze. For most games, a mouse is still an important tool. The touchpad is great for web surfing and productivity. Asus ROG G752VT comes with a 17.3” display. It is indeed a very interesting screen, especially for gaming. I enjoyed playing on the Full HD monitor. The IPS panel comes with great color reproduction with 360 nits brightness. This is above the average brightness in the category. Viewing angles are solid with a reasonable quality 1080p resolution. The machine supports the NVIDIA G-Sync with a 75Hz refresh rate. 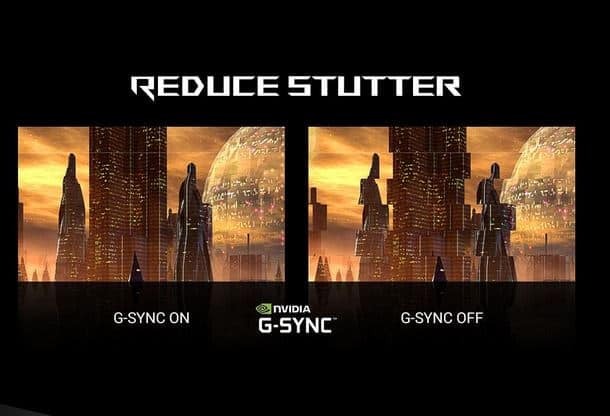 To be fair, only a few monitors have the NVIDIA G-Sync technology, let alone the notebook displays. The feature reduces screen stuttering and tearing during games. Most competitors have gone for higher resolutions, with some going all the way up to the 4K. It is important to note that the mobile PC hardware in the Asus device cannot deliver quality, smooth framerates in the new titles with more than 1080p resolutions. The screen finish is matte and not gloss. While this is not an inviting feature, the issue of glare is no longer a problem. During our tests, the screen contrast was at 680:1. This is a great score for a laptop. The benchmark test results indicated that the Asus ROG G752VT notebook spanned 92 percent of sRGB and 72 percent of the AdobeRGB on the color gamut. This is highly respectable for a laptop. The Gamma came at 2.1 is only lighter than the 2.2 target. The average Delta error was just 1.87, making the notebook’s color accuracy very reliable. From the category, the Asus ROG G752VT machine performed very well compared to the Razer Blade whose contrast was poor. The Alienware 15 recorded lower color accuracy and a narrower contrast ratio. Acer Predator 17, the main Asus’ rival, fell behind in both color accuracy and contrast. 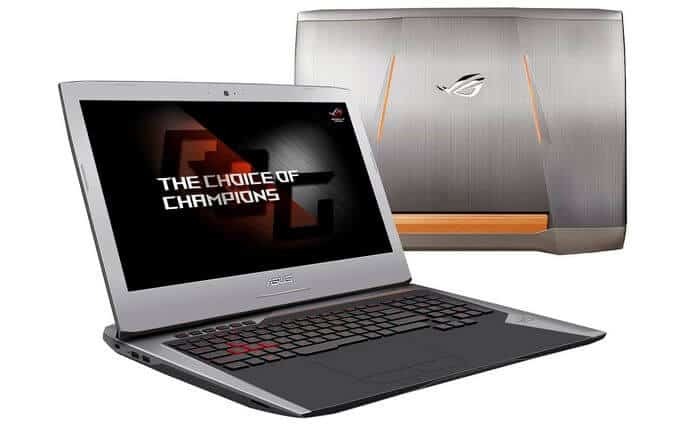 The Asus gaming powerhouse runs on a 2.4GHz Intel Core i7-6700HQ processor. The machine has an NVIDIA GPU option ranging from GTX 965M to a cool GTX 980M. The test model we used could, however, not be configured for GTX 980M. It could utilize the i7-6700HQ with GTX 970M graphics. The CPU can be boosted up to 3.5GHz on Turbo while the GPU boost can go up to 1038 MHz. Optimus graphics and manual graphics switching options are not available. To enable sufficient gaming and multiple tasks running concurrently, the machine can be configured up to 64GB of RAM. The 4 SODIMM slots can accommodate up to 16GB of DDR4 each.